Metallica last played the Pacific Northwest about a year and a half ago when 70,000 plus filled the massive CenturyLink Field in Seattle. On Sunday, the fathers of Heavy Metal played the rather quaint, comparatively, Spokane Arena where maybe a little more than 10,000 filled the two-level venue that plays home to a minor league hockey team. And what a difference the place makes. That’s not to say the show in Seattle under performed, quite the contrary in such a large outdoor setting. However, Metallica’s performance for those who made the trek to Eastern Washington offered a different perspective an outdoor stadium simply cannot attain. Indeed, Metallica brought a stellar setlist to Spokane, WA. 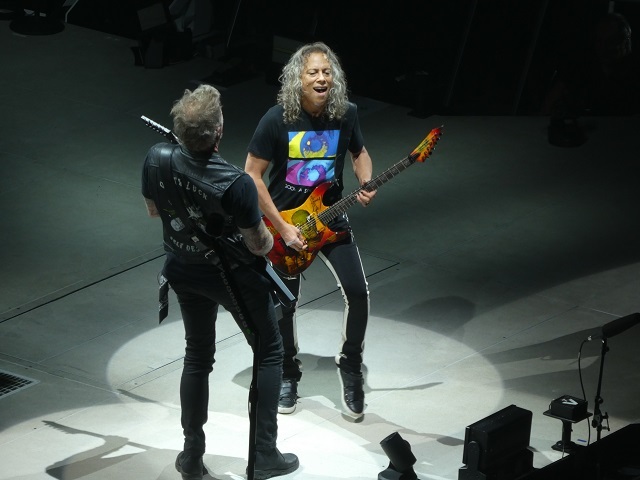 They featured a career encompassing 19 songs that stretched nearly two and half hours as their WorldWired tour in support of their 10th studio album Hardwired…to Self-Destruct, now more than two years old, works in the arena leg after last year’s stadium swing. The band began the evening with the title track off Hardwired…To Self-Destruct and “Atlas, Rise!” then all the way back to their 1983 debut album Kill ‘Em All for “Seek and Destroy.” They set a blistering pace for the first 13 songs, which included more classics like “Leper Messiah,” “Creeping Death,” “The Unforgiven,” “For Whom the Bell Tolls” and the Ozzy Osborne cover “I Don’t Know” in a tribute to the prince of darkness whose 70th birthday was just a few short hours away, by lead guitarist Kirk Hammett and bassist Robert Trujillo (who sang) before taking a well-deserved breather as (Metallica) lead singer and guitarist James Hetfield thanked the crowd for their dedication and imprinted Metallica on two youngsters in the audience. 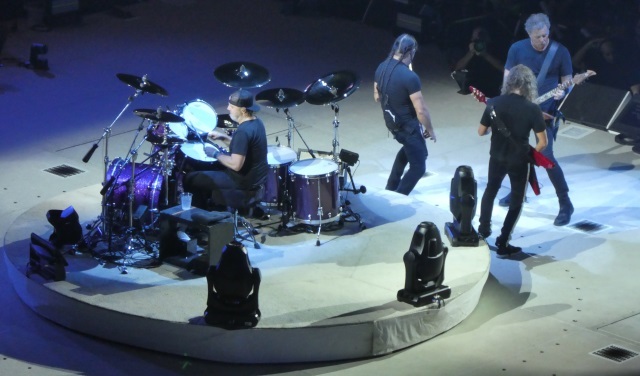 Metallica brought the “in the round” stage setup that worked quite well for the Death Magnetic tour and allows the full use of the arena rather than closing off a rear section for the amphitheater layout. The smaller venue stripped the stage setup down some however they still incorporated some pyro techniques that surrounded drummer Lars Ulrich with fire for “Creeping Death” and “Blackened” and a must-see drone configuration of fireflies that scattered from the stage during the eventual vintage “Moth Into Flame” off their latest release. They kept the drum line from the last time out as all four band members grabbed the sticks for a “Now That We’re Dead” finale and dropped as many as 36 box-shaped video screens throughout the evening. To experience one of the biggest bands on the globe – they literally have stepped foot and played on all seven continents – in such a small setting (especially after seeing a sea of people the last time out) feels at times surreal but whoever runs the soundboard needs to adjust the settings. Trullio’s bass often overpowered everyone else (former bassist Jason Newsted would certainly take umbrage) and a few songs took a bit of time before the “oh that song” set in. Some band’s power-up the treble, Metallica powered up the bass and it had just as feeble affects, at times. Nevertheless, Metallica seems to never sleep. 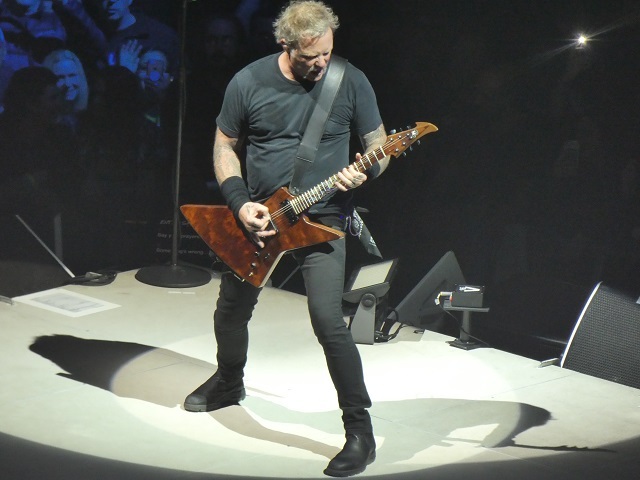 They toured Death Magnetic nearly endlessly (and ripped a solid version of the sorely underappreciated “The Day That Never Comes” off that album) and now continue with multiple legs for Hardwired…” Hetfield told the audience they do what they love and love what they do. 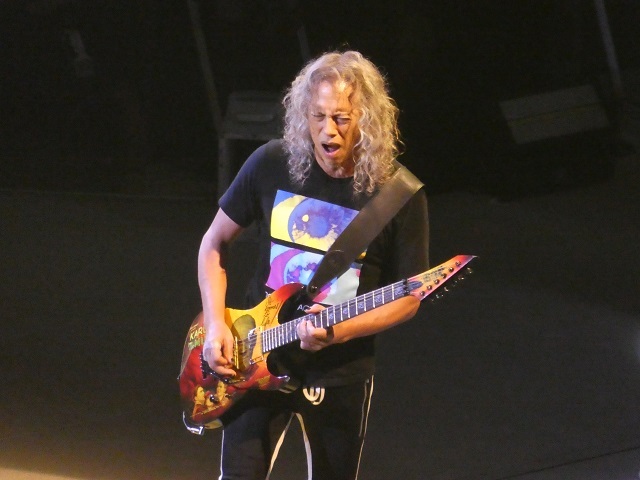 Heavy metal doesn’t sink in with everybody but Metallica have advanced the cause and developed a connection with their audience very few bands can advertise. Wherever they may roam the charmed fans follow. So let this review be written, so let it be done, now let me go to Portland where perhaps I can sit back and enjoy the show without so much the annoyance of pen and paper. Album Review: Smashing Pumpkins – Shiny and Oh So Bright, Vol. 1 / LP: No Past. No Future. No Sun. Nice to see them scale it down to a 10,000 sized arena. Another easy night of revenue for Cashtellica! Thats a cool setlist as well! Thanks deke. I never saw them in the early days but it felt a bit like seeing them during their rise to fame. Yeah that’s the great thing as they play a cross section of material. They don’t forget there roots! Holy cow. When was that!? Nice setlist! I saw them at MetLife last year but would have liked to see them in a smaller venue also. Think they played Webster Hall but unfortunately, tickets were gone real fast! Wow, MetLife is massive! Tour extends thru 2019. Hope you can catch them in a smaller place. So much better.